Home » What are Rare Earth Elements? Raw materials are essential for the functioning of the economy of an industrialised region like the EU. The global demand for non-energy raw materials has experienced an unprecedented growth in the 20th century. The notable increase in raw material consumption during recent years, the geographically uneven distribution of earth's mineral resources, the intense exploitation of most of the sizeable and high grade deposits in Europe and the restrictions on foreign investments and exports recently posed by China, make the supply of raw materials at reasonable prices one of the greatest challenges for the EU in the 21st century. As a response to this, the EU launched the EU Raw Materials Initiative, and showed that among all the raw materials examined, the Rare Earth Elements (REE) were among the most important in terms of economic significance and predicted risk of supply. The EU is currently 100% dependent on imports, mainly from China. Rare Earth Elements (REE) is the collective name for 17 chemically similar metallic elements (the lanthanides, Scandium and Yttrium) that occur in a wide range of REE bearing minerals and are mined collectively. They are usually divided into the light REE (LREE) and the heavy REE (HREE); the latter are found in relatively lower concentrations in the Earth's crust. Due to their chemical similarities, REE extraction is a technically complicated process, requiring intense processing. 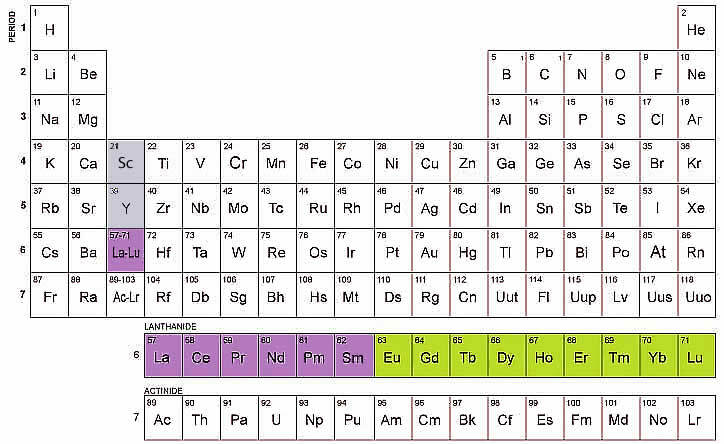 Periodic table highlighting the Light Rare Earth Elements and Heavy Rare Earth Elements. Click on the coloured boxes for more info. 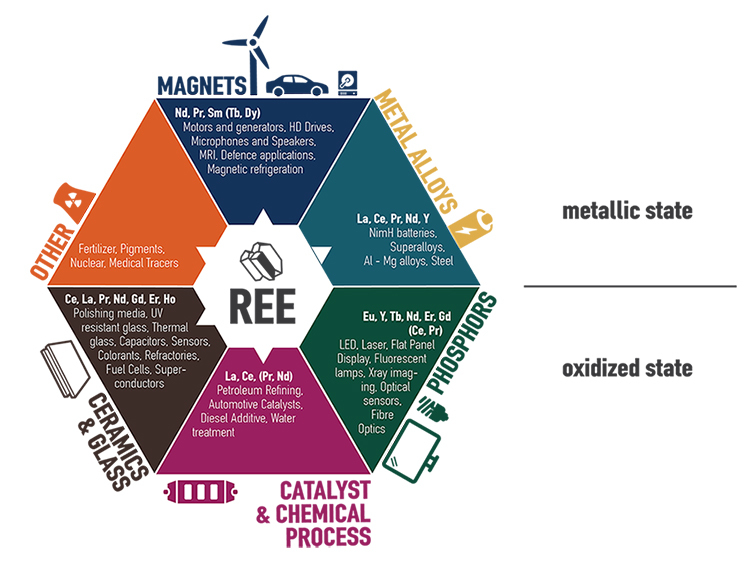 The REE are essential raw materials for a wide range of applications, including metallurgy (metal refining and metal alloying), catalysts in the automotive and the petro-chemical industry, colouring of glass/ceramics, phosphors (LEDs, compact fluorescent lamps, flat panel displays), lasers, rechargeable solid state batteries (Ni-MH), fibre optics and others. Additionally, REE are vital elements in emerging technologies such as solid state fuel cells, superconductors, magnetic cooling, hydrogen storage and high performance permanent magnets. The latter are crucial in a variety of high-tech applications ranging from wind-turbines and hybrid cars to HD drives and cell phone speakers and microphones. Uses of the Rare Earth Elements. Rare earths are not currently produced within the EU. However, several REE deposits have been located and some are even being developed by mining companies. To date, the Geological Surveys of European countries in which REE deposits occur, such as Sweden, Norway, Denmark, Finland and Greece, have worked to define and characterise their domestic REE resources.